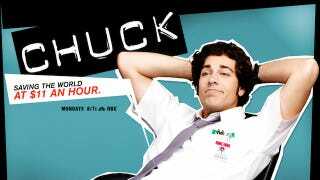 NBC's Chuck tells the story of an ordinary geeky dude who becomes an ultra-capable super-spy. It's become an oft-embattled cult favorite for the parade of genre stars, nerd references and video game cameos and now its lead star gets to reap the ultimate reward. According to The Hollywood Reporter's Lesley Goldberg, Zachary Levi's going to host Spike's Video Game Awards show, which airs in a few short weeks. He's one of the better-known celebrity gamers and has been a constant presence at Comic-Con International in San Diego. He's done voice work for Halo: Reach and Fallout: New Vegas and recently launched geek culture website The Nerd Machine. Now, he'll be watched closely as viewers gauge just how excited to be when their favorite games win—or lose—big as trophies get handed out to the games of 2011.